There’s a certain mystic about Baja California. Some people are scared to death of going south of the border and others crave going every chance they get. I am one of the latter, and was very excited when I got the call from BFGoodrich asking me if I would like to spend a couple of weeks in Baja putting their latest and greatest all-terrain tire to the ultimate test… After all, Baja is where it all began for BFGoodrich back in 1975 when a group of engineers and other crew members came down to the wilds of Baja to test an all new tire that would soon take the off road by storm. In 1976, in an off-road world dominated by bias ply tires, BFGoodrich officially launched the radial All-Terrain T/A. 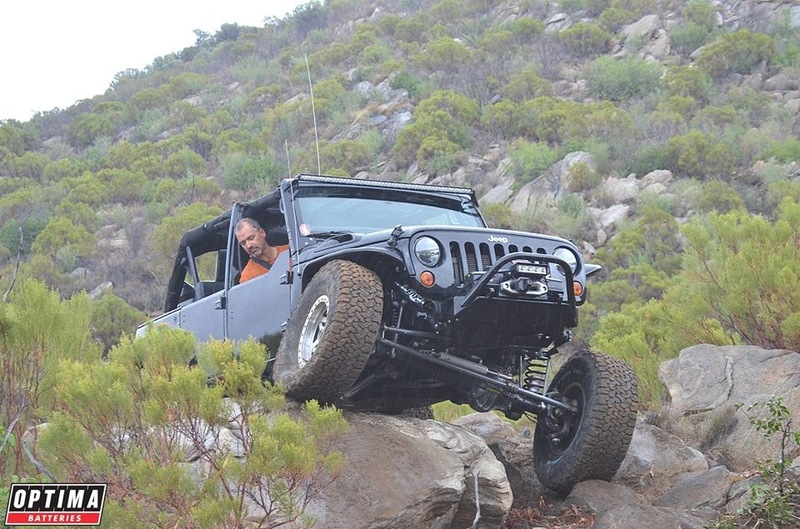 Nearly 40 years later, BFGoodrich is still doing product development in Baja. 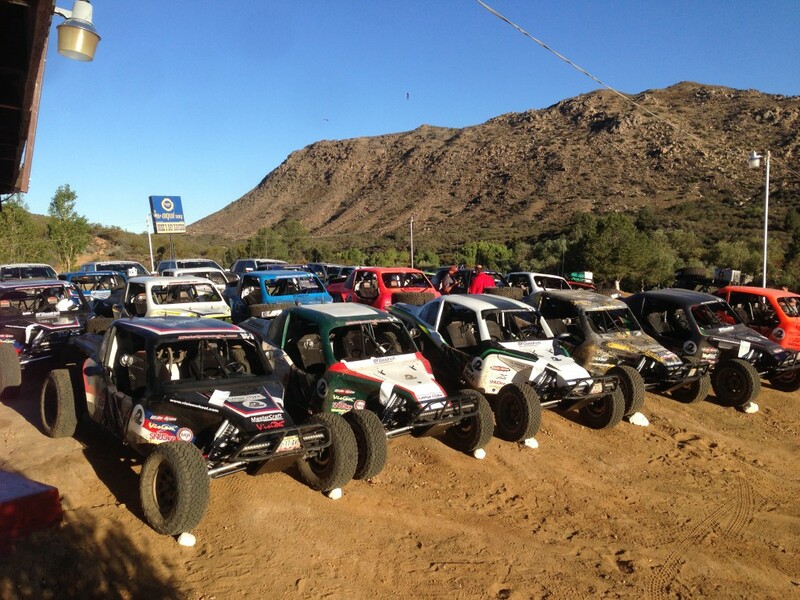 So what better way to launch the 4th generation All-Terrain T/A KO2 than in Baja? But this wasn’t going to be just a bunch of nerdy engineers getting their pocket protectors dirty and driving around a rental truck and running tread wear algorithms and calculations…This was going to be like no other tire launch I’ve ever seen. 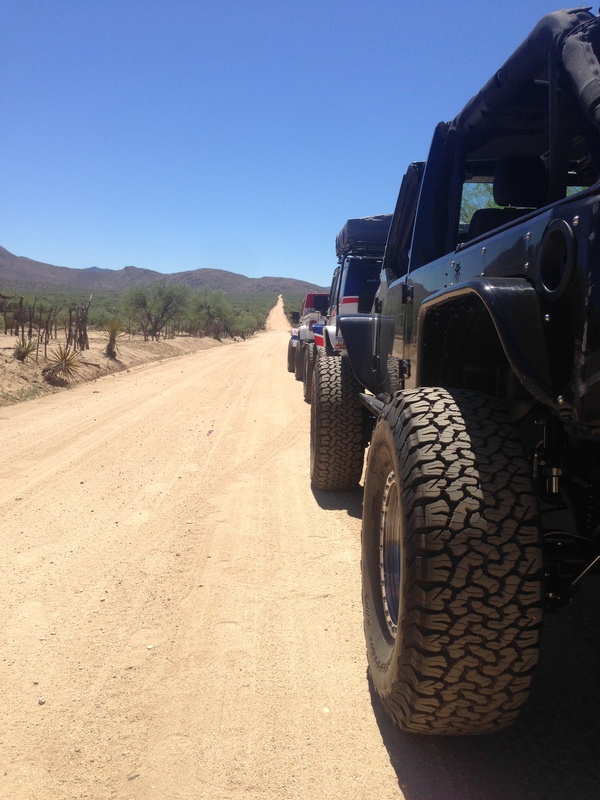 BFG invited approximately 200 media, industry VIPs and influencers to put the BFGoodrich All-Terrain T/A KO2 to the ultimate test. Armed with 22 Baja Challenge desert race buggies, 8 Miller Motorsports prepped Ford Raptors, and 3 rock crawlers all outfitted with off the shelf KO2’s, BFG intended on showing the world that the latest All-Terrain KO2 truly is not only the toughest all-terrain tire ever built, but provides the most traction and tread wear of any all-terrain. Guests would begin their adventure down at Horsepower Ranch which is located just east of Ensenada on the west coast of Baja. From there they would all get the opportunity to drive the Baja Challenge cars and Miller Motorsports Ford Raptors on parts of the actual Baja 1,000 race course all way up to Mike’s Sky Ranch (about 135 miles off-road). Once they arrived at Mike’s, the guests exited their buggies and trucks and were escorted over to the rock crawling exhibition area. This is where myself, and rock crawling champs Larry McRae, JT Taylor, Brad Lovell, and Roger Lovell built a virgin rock crawling course complete with jagged boulder strewn climbs, gnarly drop offs, and sharp knife-like sticks sticking out of the ground threatening to slash an unsuspecting sidewall. 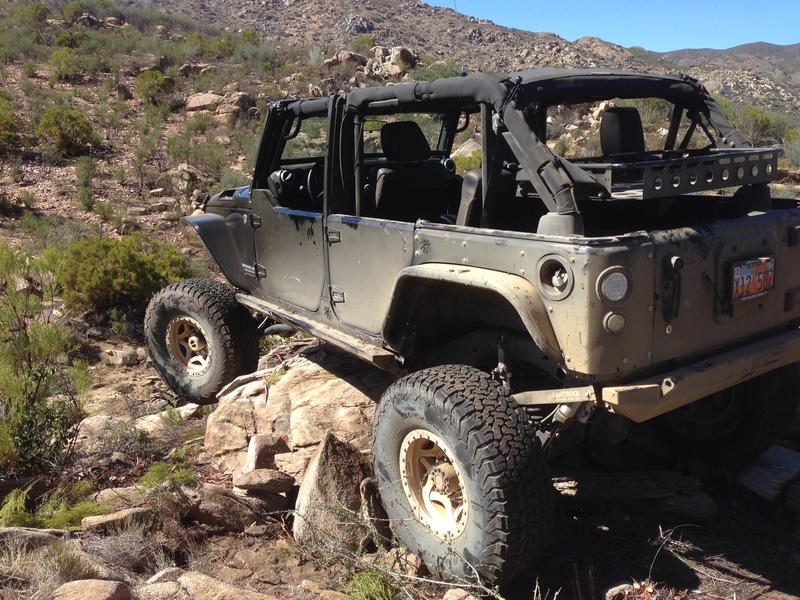 After countless laps around our rock crawling course it was clear that BFG had indeed built the toughest all-terrain ever as we had zero tire failures. 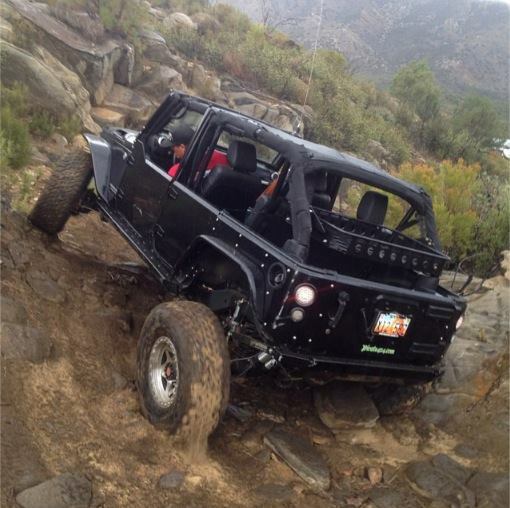 Many of the guests that we took on the course simply could not believe the beating the tires were taking and how much traction they provided on the challenging rock crawling course. After a couple of laps of rock crawling, the guests were treated to steak dinner and an open bar. The next morning everyone would have breakfast and then it was back into the buggies and Raptors for another day of intense off-road action across rock strewn dirt roads complete with massive cliffs which would take them all the way to the Pacific Ocean. From there they would head north back up to Ensenada to complete their 145 mile adventure. With all of the vehicles involved in this adventure the new BFGoodrich All-Terrain KO2 endured approximately 32,000 miles of torture. To my knowledge there was only one tire failure the entire time and that was due to a driver getting a little carried away and slamming a rock while sliding sideways at 60mph. After all was said and done, it was time to pack up the Jeep and DRIVE it back to Poison Spyder Customs headquarters in Banning, CA. With about 4 hours of road driving, I continued to be impressed with new KO2. I have been running 39” Krawlers on my Jeep for years and the difference between the two on the road were more than night and day or apples and oranges. I didn’t know my Jeep could drive that smooth or quietly! 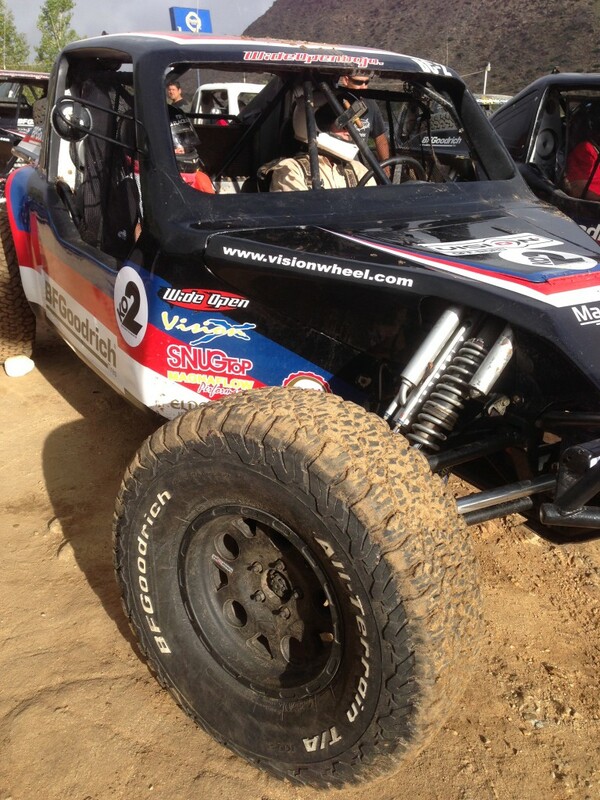 This Baja Challenge car won the 2013 Baja 1000 with this actual set of BFG KO2s. They are still tearing up the desert! BFGoodrich plans to offer 61 sizes in the KO2 (vs the KO’s 53 sizes). Limited sizes will be available when the tire is first launched this year (only 12), but the remaining sizes will be available in 2015.